Improve English Communication Skills With Ease, Now At Pune! While choosing the career sectors like IT, Hospitality, Medicine, Marketing, business management, social work or any other what you needed is Knowledge about the field, Technicality, presentation skills and confidence. If you are good in technicality but you don’t have English communication skills to present it at that moment you will lose your confidence and come to backfoot. Just because of the language problem, you might miss many opportunities in your life. But how could I improve my English language? English coaching institutes in Pune can help you to overcome all these loopholes and make you a confident communicator. Being in any of the above business you need to have active or moreover proactive communication skills. Why am I emphasising on communication skills along with the English language? Spoken English Classes in Pune can give you a satisfactory answer in their training program. Let me first tell you that knowing English doesn’t mean that you can speak fluent English. “English” is a language alike other language and “Communication” is a skill or art which you have to acquire either by yourself or with expert’s guidance. We don’t just put a dictionary in your hand to grab the words with the use of grammar. No, not at all! We have well-developed English-speaking institutes in Pune that will help you to understand the meaning of words, the flow of grammar, different flavours of language and our experts will guide you in developing communication skills while learning English. LotusITHub is giving a complete package to learn and understand the glory and the richness of this language, as it is globally known and practised almost everywhere in the world as a common mode of communication. The best English-speaking classes in Pune will train your brain in multiple fronts, they will teach you how to think in English? How to express in English? How to represent your knowledge in an impressive way in English? And many such a thing that today you can’t! On the psychological front, we know that the brain has multiple sources to absorb the things happening around, and we utilize them all to engage your brain and make it a champ in the sector you are lacking i.e. English! The best-spoken English classes in Pune work for those who literally want to work on their flaws and want to convey their ideas and thoughts to the world in a polished manner. Learning English is a continuous process it needs time, efforts, hard work, and more; but where will you get it? LotuITHub’s English speaking institute is the one-roof solution for all your problems. We will not only improve your speaking skills but also help you to develop your overall personality to present yourself in all the sectors. For more detail, you click on www.lotuithub.com and to get a quick scope of action right now! Python Classes In Pune – Integrating The Future Scope! Python is the general-purpose programming language as it seems pretty safe and continuously serving as the option for the web and application development. Python classes in Pune understand the scope behind the popularity of Python programming language as it is a multi-featured platform which encompasses the multiple programming paradigm, extensive standard libraries and tools, better code readability, vast community support, fewer lines of codes and many more. The certified faculty of LotusITHub will assist you with Python training in Pune which includes understanding portability of this open source grooming language with the platforms like Linux, Windows, Solaris, AROS, PlayStation, etc. Python is the object-oriented programming language (OOPL) used for web programming development, desktop application development, GUI application development, Software testing, writing system administration software, widely used as a scripting language for hackers, for data analysis, etc. Join Futuristic Python Classes in Pune! User-friendly, open-source, easy to understand language which focuses on the solution rather than the syntax. Procedure-oriented programming platform which can be reused in pieces of programs. It is built around the objects which concatenate data and functionality. It is easy to integrate with other languages by using several mechanisms, for example, Jython – provides an implementation of the JVM. No doubt python has the huge career opportunity in the enterprising sector, especially in the IT industry where Python developer can work on the profiles like software engineer, research analyst, Data Analyst, Data Scientist, Software developer, and more. As far as the success of Python technologies concern Python training in Pune will help you to take deep dive into its core element used for research, production and further development. LotuITHub has compared and understand the dominating future scope of Python when technologies like Artificial Intelligence (AI) Machine Learning, Internet of Things (IoT) comes into play. Let’s take a step ahead at Python classes in Pune to integrate the Python frameworks, libraries and tools with AI to reduce human efforts with effective efficiency in various development purpose. Future Scope Of Angular Training Course To Shape-Up The Career! Angular JS is an open source framework that enables the browser to dynamically render and display content with increasing UI flexibility to give intuitive web pages designs. Angular JS is highly growing technology in the application world and it has a tremendous demand in the enterprising industry with high pay. Angular JS is flooded with the features which mainly include modules, directives, templets, scope, expressions, MVC (Model, View, Controller), Validation, Services, Routing, Dependency Injection, Testing and more. Enterprise applications developed today, target the ubiquitous support in the web applications, mobile or desktop applications as well. Angular JS classes in Pune will guide you in developing skills in this leading technology along with its spikes in trends like NodeJS, Java, etc. to maintain its pace for owning an extensive use. 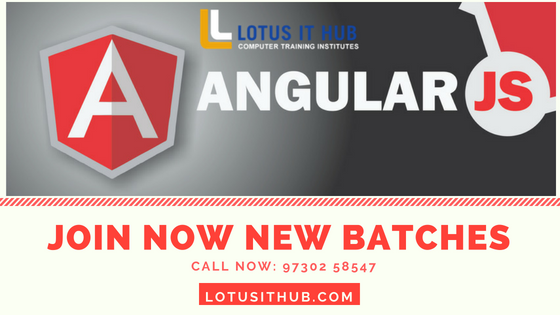 LotusITHub is the ground of technologies where a newbie can start their career path with expert’s assistance, our Angular JS Training course is designed for all the enthused developers over there. For the quick scope of interest connect with us now, click on www.lotusithub.com and choose the best for you! English speaking classes in Pune is the roadmap of your career! English is a globally used way of communication; it’s the skill and media of a transformation possessed by the working world. Statistical data proves that more than two-third of the learners in a global market are teaching English just to build-up their career either in their native country or in overseas. The command over the language can improve the way you deal with the work and help you to make it effective. At English speaking classes in Pune, we will illustrate you with the following points to take steps towards your shining career. Best spoken English classes in Pune will make your way hassle-free with the concrete knowledge of this second language. In the corporate world the language of communication is English, or it is the media of expressing your talent. If you have skills but you can’t express it, then it is of no use. Therefore to prove yourself on the world stage best English speaking classes in Pune take 100% efforts on their individual candidate. Besides the way of expression advantage; speaking multiple languages make your personality more agile. With its knowledge, you can overcome the complex situation easily and can perform varied tasks single-handedly. Best English speaking classes in Pune, can polish your overall personality and make you better decision maker. It actually a perfect guide for the journey of your career. ‘Soft Power’ doesn’t mean softening abilities; it means the persuasive approach to build the relations typically in the informal world and make your impact on them. In your career graph plays a useful role in networking and building client relationships. As we said English is the roadmap to achieve your goal, regardless of the field or technical sector it has its own importance in every fraternity. Without knowing English you can’t expand your walls of knowledge. Globalization has crossed the boundaries and encouraging people to think beyond the nation. It has opened the global platform for every individual to explore. At Lotus IT Hub, Karve Nagar, Pune, we try to provide all the current and basic knowledge about every aspect of the English Language. So, take the next step in your career with the best English Speaking classes in Pune now! Give a Digital boost to your carrier at SEO training in institute in Pune! The digital market is the amalgamation of sales, analytics, copy writing, creative direction, digital media and many more things. Digital Marketing courses in Pune make you perfect in each discipline with a faster and more effective way. The dynamic nature of the world market demands the adaptive change to keep wheels rotating. In this cutting-edge scenario, you have to select the most reviewed and handpicked digital marketing course to build a successful career in the field. In simple words, digital marketing is the effective involvement of the electronic devices or complete utilization of the online platform. Today’s modernized world is so much time plugged and handy with their devices that their routine it tied-up with it. To attract the target audience how exactly digital marketing help? What exactly digital marketing is? How to create an effective marketing strategy to run a virtual business? And many more questions in your mind receive their satisfactory answers at Lotus IT Hub’s Digital Marketing training institute in Pune. What are effective Components of Digital Marketing? These all prospects about the online world you will learn at a digital marketing training institute in Pune. Digital marketing is the huge platform to explore the career; this is the only platform which connects the world. It provides an opportunity to improve your skills and roam around the world. At SEO training institute in Pune you will learn the tools and technologies to tackle the challenges in the present and immediate tomorrow. Digital marketing is the way to maintain the visibility in a world. When you learn digital marketing in Pune Lotus IT Hub in Karve Nagar offers you a cerebral approach to analyze the opportunities in the open market and create a pathway for you to seize your career opportunity. We appreciate your hard work and track & measure your efforts to ensure your success. 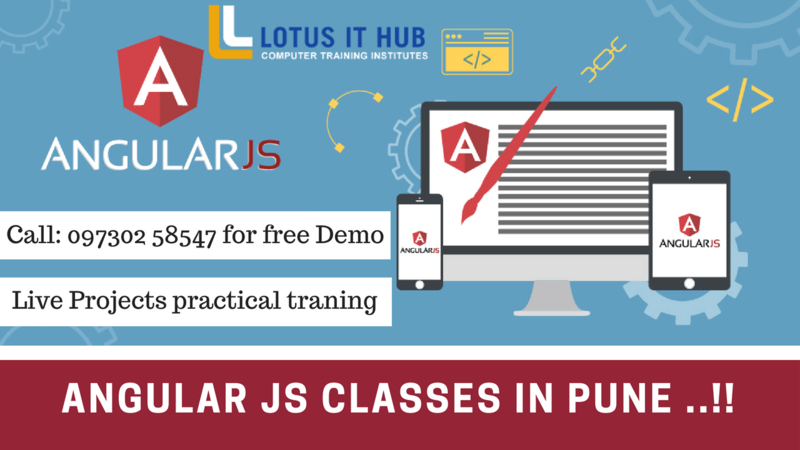 Let’s make it easy with Angular JS classes in Pune! Looking to learn Angular JS? Then let’s make it a piece of cake by joining hands with Lotus IT Hub. We provide the angular js training course to give a boost to the instinct of the student. At our institute, under expert’s guidance, we try to expose the best inner skills of our aspirants. Besides keeping the talent in the packed gift box we are intended to present it through a variety of vantage with complete perspective without any barrier. Besides diving into an unknown ocean it is important to knock on its door to understand the pros and cons of the platform. The actual execution of the learning process the teaching staff of our Angular js course will demonstrate you whether this platform will amplify the functionality of your application or harness the power. At our counseling session, we will give you a clear idea about what you’re about to get into, before picking the sector. With superficial glaze, we make you aware about its future aspect to illuminate your future planning. Lotus IT HUB is the prominent Angular Js training institute in Karve Nagar, Pune. Besides roaming here and there visit ones and we guaranteed you that you will not feel disappointed! Prospect the future with ASP.NET classes in Pune! .Net has a promising future which we can’t deny; Asp.net is ranking on the highest position as per the research. These all things make it clear that joining ASP.Net coaching classes in Pune worthy for all .Net frameworks. At ASP classes in Pune providing software language training from a long time now and has steadily changed and evolved over the years. Simultaneously they grasp the improvement in the platform like MVC, generic, LINQ, and many more. The professional experts from Lotus IT Hub said that “It is a tempting experience to explore such wonderful language platform and grow with it”. During ASP.net training in Pune you will understand the fact which makes it viable is the wide versatility of the C#. It is used in the variety of applications with .Net core on MacOS and Linux and for them there is no limit to perform the action. The official Microsoft ASP.Net site is the open source server-side web application specially designed framework for the web and the enterprise application development. Why should you join Lotus IT Hub for ASP.Net classes in Pune? When it comes to development provinces, .Net is always favored by the technological world. It comes with the famous MVC framework which makes it easier to understand for the aspirants. To find a way to build a prolific career in the same fraternity ASP.NET training centre in Pune come for the rescue. We offer step by step guidance with practically applicable formula to achieve the level of excellence in every minor factor. MVC has three bifurcations which are business logic, UI logic and input logic. Dot net classes in Pune drives you over all the practical applications of this platform. Lotus IT Hub computer training institute in Karve Nagar, Pune. Here, you will receive all integrated software course with expert guidance. You can come for the free consulting session or visit our official site www.lotusithub.com to know more about us. Certified Python Classes in Pune ! Let me tell you why? If you ask me programming future then, I will say Python! Trust me, it’s one of the most powerful languages with which we can create everything. YouTube, Instagram, Netflix, Quora and many such trending platforms run over python. During Python training in Pune, you will learn all these things including its practical applications. At Python classes in Pune, you will understand that it is easy to learn, fastest-growing and coolest programming language. Let’s discuss it with an example; Django is the well-known Python framework with which you can build a single page web application from the low-to-high end. Prospect the Future of Python at Python training institute in Pune! It has easy to implement scripts with some popular frameworks such as a Django, Cubic Web, Pyramid, Web2py, etc. It is helpful in implementing server-side application logic regardless of the speed and sizes of the server. AI (Artificial Intelligence) is the booming trend in the market as the future is all about AI and machine learning. At Python training in Pune you will learn how to take the complexity and avail its prospects? It gives freedom to the programmer to explore various sectors of the programming. At Python coaching classes in Pune our professional experts will guide you with the web & application development, System Administration, game developing, etc. To get a brief introduction about Python and other programming languages, Lotus IT Hub is located in Karve Nagar, Pune. You can visit our premises for a free consultation as well as an aspirant can attend the demo classes at the time of the visit. Learn tips, tricks & techniques at PHP training in Pune! We all know very well that PHP is the widely accepted web & app development language. It is one of the easiest software development languages to learn at PHP training institute in Pune for all the age groups. It is the language behind some of the powerful applications we use in our everyday life such as a Face-book and word-press. With the easy to learn tips, short tricks and techniques aspirant can speed up their coding skills and can become a responsive, reliable, clean, and more optimized PHP programmer. Application building by using an MVC framework, with it you can separate dynamic (PHP) code and static code (HTML, CSS, JS) which is a helpful approach for maintaining the code. PHP is the server-side scripting language with dynamic PHP pages. Google analytics visits and review with PHP and can fetch data from the database with it. How to use custom files? How to avail basic web services using PHP, My-SQL, XML, and JASON. At PHP classes in Pune, students learn such easy going as well as complex to tackle techniques from qualified and experienced staff. We all can see the rapidly changing scenario in the technological world and newly evolving techniques in the PHP gives rise to new & unaccepted things which we must have to learn. There is always room for perfection & improvisation to upgrade the knowledge by knowing the tactics in the field. During PHP training in Pune, you will receive insider knowledge about PHP programming and make you flawless PHP programmer our professional expert take efforts on an individual aspirant. To know about our institute click on www.lotusithub.com here, you will find all the trending technologies under one roof. Visit our premises at Karve Nagar, Pune and attend free demo session and make your way clear to rise above the skyscrapers.